Mozilla released an update for Firefox today that brings the version of the web browser to 63.0.3. Firefox 63.0.3 is a bug fix release that addresses several bugs in the web browser; the new version fixes an issue with Unity-made games, magnet links not working any longer, and several crash fixes among other things. Stable versions of Firefox should pick up the new version automatically. If that is not the case, run a manual check for updates with a click on Menu > Help > About Firefox. The browser queries Mozilla's update server and should return the new version to you. Firefox 63.0.3 is available as a direct download on Mozilla's website as well for new or offline installation. 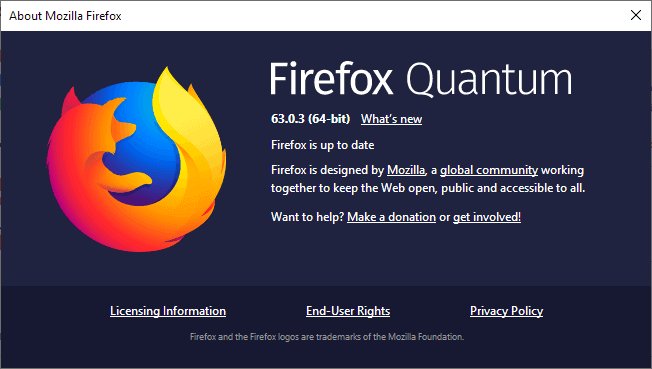 What about Firefox 63.0.2? That version never hit the desktop population; it was an Android-only update for the browser that fixed crashes, freezes in Samsung Galaxy devices, flicking on some sites, and the session history popup. The new version of the web browser addresses several bugs. Firefox users who use it to send magnet link information to torrent clients may have noticed that clicking on these links would not do that anymore in Firefox 63.x. The new version fixes the bug so that the functionality is restored. While it was possible to copy the link and paste it in the torrent client as a workaround, it was not overly comfortable especially if you had to do it multiple times. Gamers may have noticed freezes in games that they play on the Web in the browser. The issue affected games made in Unity that used WebGL; Firefox might throw a "a web page is slowing down your browser" notification when that happened on top of that. Mozilla patched a proxy issue in Firefox that would slow down the loading of pages for users with specific proxy configurations. Mozilla found a bug that prevented Web Proxy Auto-Discovery (WPAD) from working properly in Firefox and corrected it with the release of the new version. Firefox developers disabled HTTP response throttling in the browser by default in Firefox 63.0.3 as it caused issues with background videos. Mozilla fixed two crash issues in Firefox 63.0.3 as well. Only one crash is accessible publicly on Bugzilla. It describes a startup crash caused by a Firefox component. Switched to Vivaldi week ago after more than a decade being Firefox user. Mozilla killed Firefox, R.I.P. Thanks, Martin, I was already wondering what happened with the Firefox 63.0.2 release and I was checking twice when installing or I downloaded the correct version. It’s really nice to see that over the years (release after release) Mozilla is really trying there best to keep Firefox not only alive but also a top op the shelf product. I can see that also quite significantly when I compare another great browser being Waterfox 56.2.5.0 with Firefox 63.0.3 because when I am doing that I really notice, not only the speed difference but also the strain it puts, on main Windows 10 1803 with 8GB & 5 core hardware. Thanks again for keeping me like always updated. What’s that new Bug on Facebook? Firefox won’t display my Entries??? Opera, Brave and Chrome do fine? Using Ubuntu 18.04 and FF is still 63.0 using their official release (where the F* are all the updates..), also there’s still no GPU acceleration for example video playback on Youtube makes playback choppy, have tried to like Linux for a few months but becoming quite disappointed when some basic and frequently used stuff such as browser and Youtube isn’t up to date, and many other things dragging productivity in the mud. I don’t know what it is but often on Youtube the tab crashes, don’t know if it’s the crappy Quantum engine or Linux, and why does the memory use grow so quickly over 3 GB after a few Youtube tabs open? Once I updated and restarted it now keeps saying it needs to restart to install the updates each time I load up Firefox. And no, its not set to a home page or anything, its the program itself going into the update wizard each time I load the program up. It thinks its not installed the new updates, or it actually hasnt installed them. Either or, its bugged.